The Good Old Days. | The girl who loved to write about life. When I walked out of my last final of college, I sobbed the whole way back to my dorm. It was a creative writing class, taught by a man I had grown to deeply love and admire. As I realized that would be my last day with him, that no one was going to be there to talk about my writing, to teach me how to write, to force me to write, my heart hurt. Pulling away from graduation, I couldn't stop crying because for a year, I had eaten dinner with my best friend every single night. For a year, she'd been a few steps away. We'd gotten ready together and drank coffee together and lived daily life together for a year, and that was over. In hindsight, college was the best. Being forced to read poetry and write stories and study authors, I miss that. I fiercely miss the community, the friendship, my best friend living with me. Those were the good old days. When we lived in Orlando, I had more fun than I've maybe ever had in my life. There were rooftop pools and Sunday brunches. Bars and restaurants in walking distance. A group of close-knit friends. We had family dinners, danced on rooftops, drank champagne on Fridays at the pool. When I think about that time and those people, I miss it and them so much my stomach hurts. Those were the good old days. Right now, as I'm typing this on my phone, I'm sitting outside watching Jack laugh and splash around in our backyard. He keeps looking over at me smiling. We shared a popsicle earlier. It's a simple and beautiful and sticky and perfect day. I know that these are the good old days. I also know they won't last forever. I know one day I'll look back and miss them so much. But here's the thing...I've had so many good old days. So many good seasons have come on gone. Started and finished. 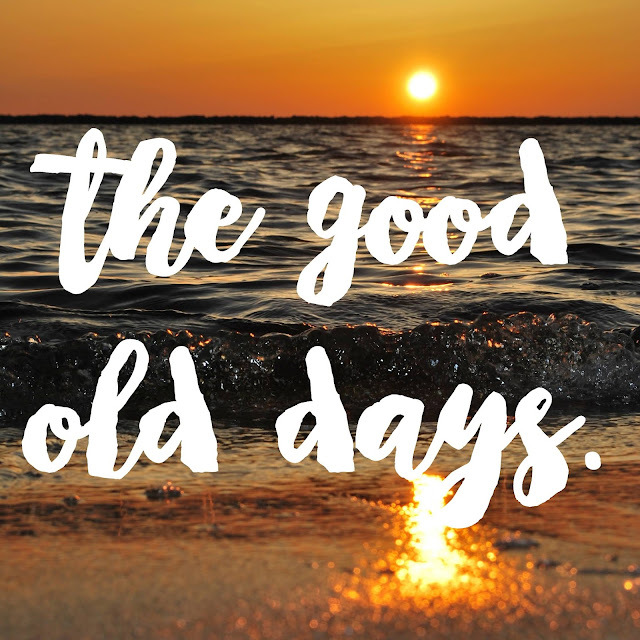 Because the thing about the good days is that you don't get to have them all at once. When we moved from Tennesse, it broke my heart. But had we never moved, I never would have fallen in love with Florida (CAN YOU IMAGINE?!). If high school days had lasted forever, I never would have met my best friends, or fallen in love with writing the way I did in college. Had that season never ended, I wouldn't have had the dancing on rooftops in Orlando nights. Friendships. Travels. Marriage. Jack. Melbourne. Orlando. Gainesville. People. Places. Experiences. So many good old days. Sometimes you know when a season is over, and sometimes you don't. Sometimes you get the finality of walking out of a place for the very last time, and sometimes you look up from life and realize it's been months since you spoke to that person, or years since you've been to that place. I guess what I'm saying is this: There is good in every season, and every season ends. With enough time and hindsight, every season becomes the good old days. So live in your moment. Live lightly. Don't cling so dearly to what you're enjoying that you might miss the next wave of goodness. Reflect on the life you've lived so far with fondness and thankfulness, but don't idolize it. Hindsight is twenty-twenty, and all that. Enjoy the present, but don't cling too tightly to it. Look forward to the future, but don't count down to it so much you miss the life around you. Live your moments. Cherish them. After all, these are the good old days.